The DriverConnect Cloud Routing feature enables fleet managers to create and send multi-stop truck routes to drivers within a single, unified platform. 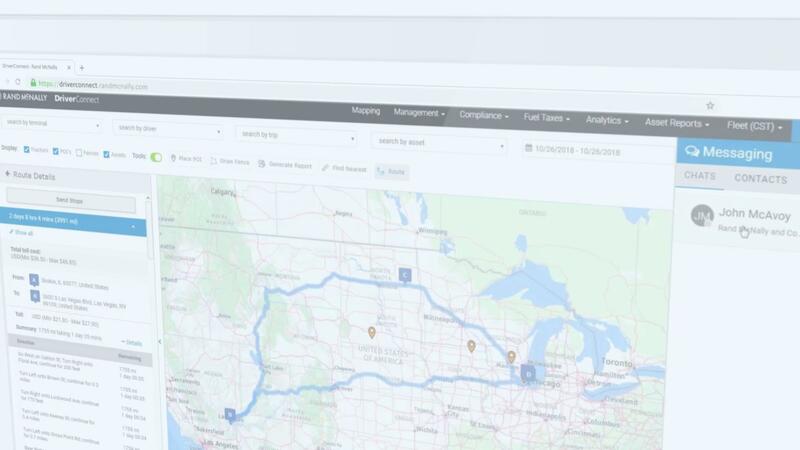 Fleet managers can create pre-planned routes in the DriverConnect portal based on a variety of factors including trailer type, truck dimensions, hazmat dimensions, shortest distance, and more. The driver will get a notification of the new route via the DriverConnect app on his or her Rand McNally truck device. From there, the driver may view, edit, and accept the route. Drivers can then navigate the approved route using a Rand McNally truck navigation device—a product drivers already know and trust. To learn more about our fleet management products and solutions, or to schedule a demo, call (800) 789-6277 or complete the below form.